It's A Dan's World: Super-Hero Vehicle Panel Art: Got Yours? 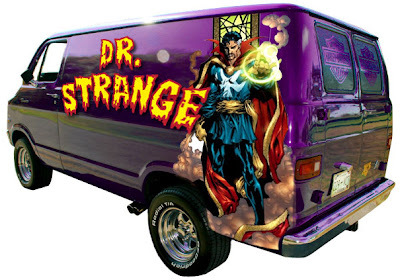 Super-Hero Vehicle Panel Art: Got Yours? It wasn't that long ago where if you were a seasoned pro with an airbrush, you had a licence to print money. Applying your trade to the panel or bonnet of any passing vehicle, you had street cred to burn. Nowadays youngun's would be suprised to find an 'airbrush' actually existed beyond the tools of Photoshop. But like a death in comics, all trends are fated to be 'reborn' and genuine airbrushing is probably only moments away - again. 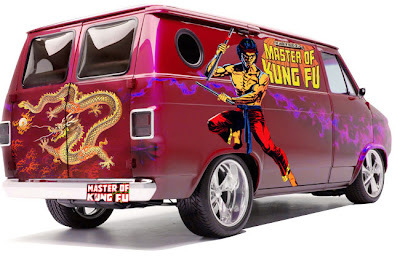 While it may never hit the hights of old, Maxim Magazine combined the two different styles of panel-art, to make their 12 Super-heroes Who Should Be On '70s Vans list. Of the dozen picked out, here are the fatal five I thought had the most horsepower. Ol' Ghost Rider is a natural, pick a more in your face shot and watch the road burn. As for ROM, he's the pimped to the back teeth with weapons! How can you not 'Pimp My Ride' with that? Shang-Chi - panel art and Bruce Lee are matches made in heaven, and Shang-Chi, Marvel's Master of Kung Fu is no exception. Check out the dragon detail on those back doors! It took me a while to get Dr. Strange as a fan, mind you it also took me a while to get Jack Kirby and now I eat his work up with a spoon. Here the Doc strikes a mean pose, but you could also go to town decking out the entire van in a trippy Strange number. 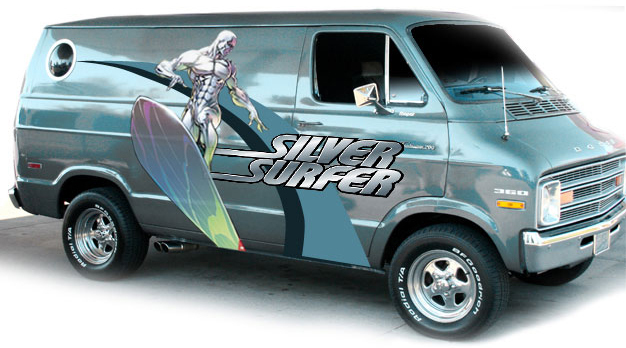 Okay so it wouldn't be IADW if the Silver Surfer didn't take out the top spot. His body would cut a mean visual on any equally metallic surface, and by chucking a few surfboards of your own in back, you could easily proof just how 'rad' Norrin is. For the full Maxim list, click the jump. i've seen these before. but i used to wonder for the longest time if these were real paint jobs on vans or photoshop trickery much like i enjoy doing. great stuff though! nice to see it here on IADW also. if these were real though i'd have to buy the ROM van when the times comes to ditch my current vehicle. Thanks for the comments David - yeah I'm thinking it's Photoshop - but if I ever see any real ones zooming round I'll shove them up on here. by "shove them up on here" i imagine your talking about your blog right? Thanks for dropping in Shahbaz!